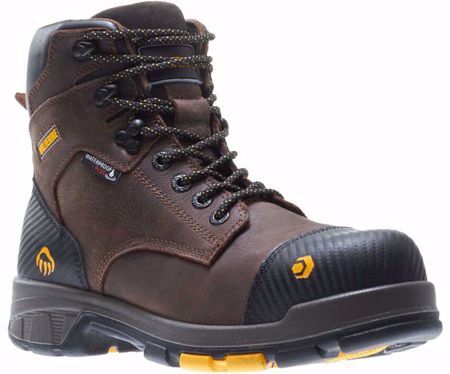 The Blade work boot features Wolverine’s EPX anti-fatigue technology that brings comfort closer to the foot. The EPX technology conserves and returns energy to fight fatigue and features a footbed with a honeycomb heel to expand to absorb impact, a cushioning midsole, a lightweight stabilizer midsole, and a rubber lug outsole. All components work together to provide unrivaled support step after step. Waterproof full-grain leather upper combined with Waterproof Plus breathable membrane ensures feet stay dry, and a durable toe bumper and heel kicker ensure long-lasting durability. The Blade boot features CarbonMAX nanotechnology safety toe for lighter-weight, better fit, and a strong structure as well as an internal met-guard that meets ASTM standard F2413-11 M I/C/Mt/75 EH.